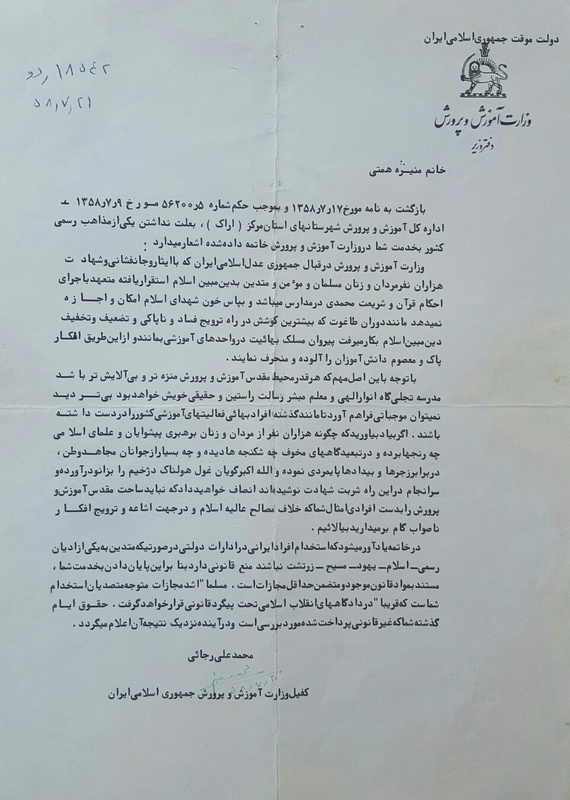 This document, signed in Mehr 1358 [September 1979] by Mohammad Ali Raja'i, Minister of Education, is the official letter of expulsion of Mrs. Manijeh Hemmati, a teacher at Nezam Vafa High School, in the city of Arak. The reason for her expulsion is explicitly stated as her religious beliefs as a follower of the Baha'i Faith. The Minister of Education maintains that the presence of Baha'is in educational agencies is contrary to the high interests of Islam and presents it the cause of polluting and subverting the pure and innocent minds of students. The salaries Mrs. Hemmati had received over the duration of her service is also declared as illegal. After the Revolution of 1957, Mohammad Ali Raja'i held other positions such as a Parliament Representative, the Prime Minister, the Foreign Minister, and the second President of Islamic Republic of Iran. The Ministry of Education is committed, before the Just Islamic Republic of Iran which has been established through the sacrifice and loss of lives and martyrdom of thousands of Muslim men and women, to implement the ordinances of the Koran and the Muhammadan Shari‘a laws in schools. In order to respect the blood of Islam’s martyrs, it does not allow the followers of the Bahá’í sect to remain in educational units and in this way defile and alter the pure and innocent minds of students, as they did in the idolatrous period [referring to Pahlavi era] when utmost effort was exerted to propagate corruption and filthiness and to weaken and belittle the glorious religion of Islam. Owing to the importance of this principle that, the cleaner and the less tainted is the sacred environment of education the more it manifests the divine light and the more a teacher will bring the glad tidings of his true and rightful mission, undoubtedly we cannot create another condition under which Bahá’í individuals control the educational activities of the country, as they did before. If you only recall how thousands of men and women, through the leadership of the Muslim clergies and leaders, suffered so much pain and torture in horrible prisons, and so many Mojahed youth of the country withstood the torture and cruelties and how they, with one call of Allah’u’Akbar, brought the terrible and dreadful monster to his knees and finally drank from the cup of martyrdom, you would justly realize that the sacred threshold of education should not be defiled by individuals like you who walk against the exalted interest of Islam and take steps to propagate and spread unwholesome thoughts. In conclusion, I remind you that hiring Iranian individuals in government agencies, if they are not followers of one of the official religions – Islam, Judaism, Christianity, Zoroastrianism – is against the law and therefore ending your service is based on existing laws requiring minimum punishment. Of course, maximum punishment will be given to those responsible for hiring you which will soon be pursued legally in Islamic Revolutionary Courts. Your previous salaries which you have received illegally will also be examined the result of which will be announced in the near future.